* Feature - ability to modify core statuses. * Fix - reordering of status under settings was not working. * Feature - ability to include files with the status emails. * Fix - php notices order status fix. * Fix - order status wpdb calls. * Fix - deprecated messages were appearing for users, this is now fixed. * Feature - set whether order date is changed when action is triggered. Setting found under Status > Actions. * Fix - some users were getting non-object errors on add product page. 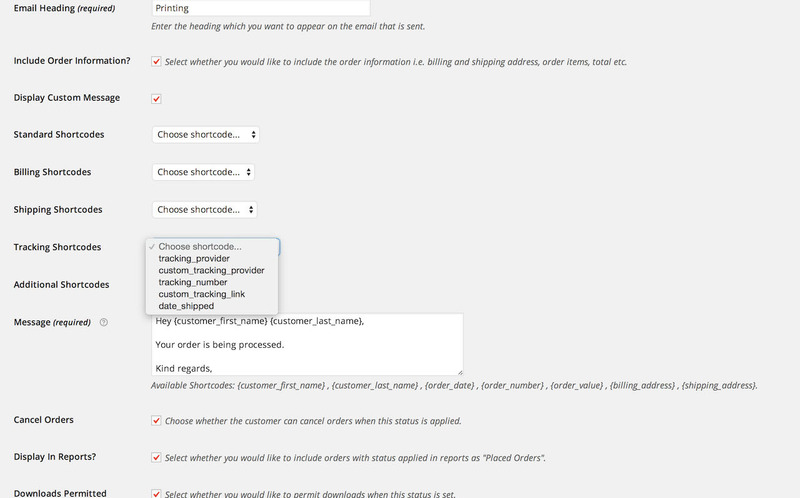 * Feature - ability to print orders as they are assigned through Google Cloud Print. * Feature - ability to define what is printed when order is assigned. * Fix - post were not being able to publish. * Fix - bulk actions was not showing the order correctly. * Feature - ability to set style for all statuses with one configuration. Remove the ability to set style for each status, the global setting will be used. * Fix - go back button was not working on localhost installations. * Feature - added messages to indicate unpermitted status changes. * Fix - users were seeing logs presented form bulk actions. * Fix - initial installs were displaying order status table incorrectly. * Fix - colour picker for default status was rendering incorrectly. * Fix - use same status button was not rendering correctly. 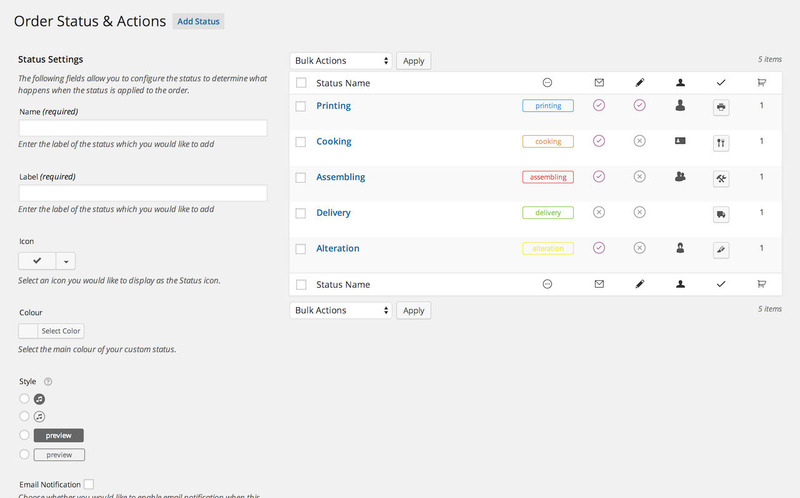 * Feature - ability to set permissions on users to trigger status to or from an order. * Tweak - tidied up the order status table. * Tweak - made compatible with WooCommerce 3.3. * Tweak - introduced new style in accordance with WooCommerce 3.3. * Tweak - relocated order status settings page. * Tweak - use same status icon for action as main button introduced. * Tweak - colour palette changed. * Fix - visual editor not working with email custom field. * Fix - visual editor for custom message under email was not working correctly. * Fix - notices appearing on the orders page have now been fixed. * Fix warning with empty string on the statuses page. * Fix bug with with payment method error. * Fix bug with warning message appearing on Orders page. * Fix bug with icons not loading properly on SSL pages. 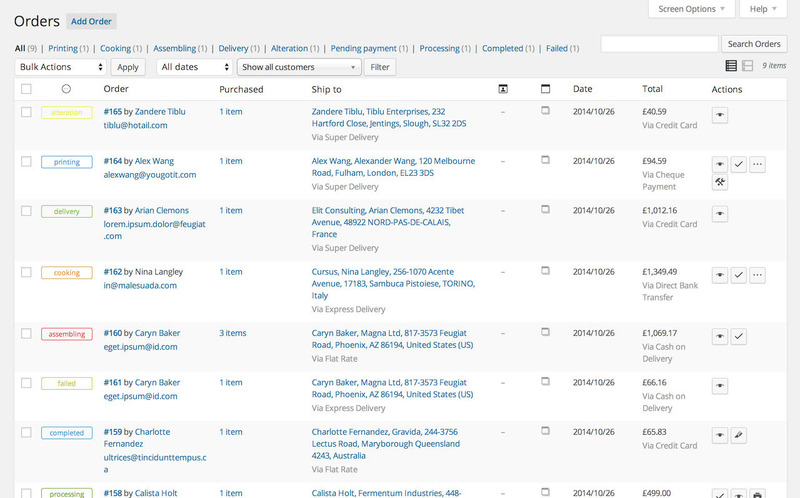 * Tweak to filters appearing correctly on Orders page. 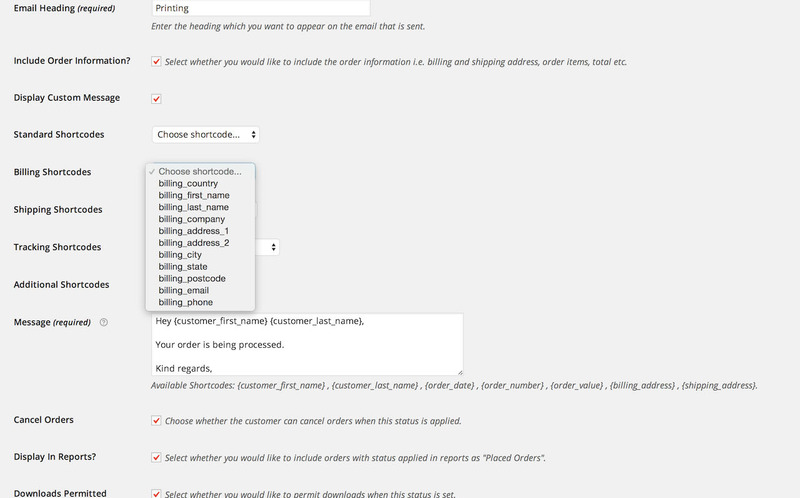 * Fix bug with statuses not displaying nicely on Orders page. * Fix bug with status labels not showing correct ending. 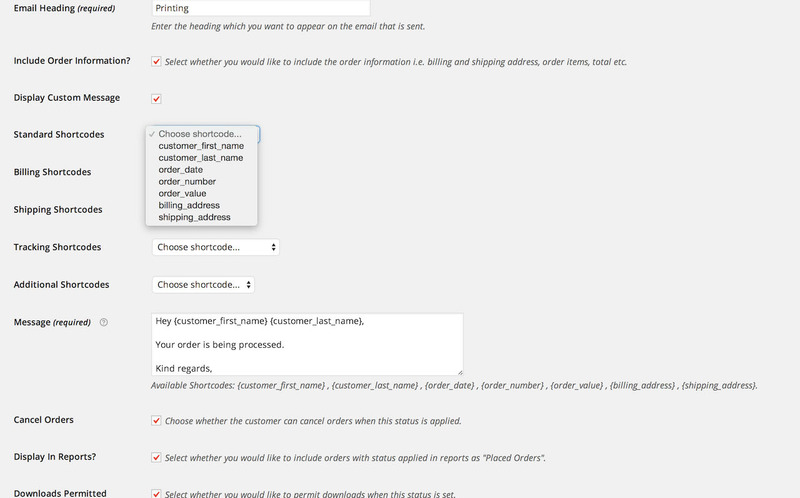 * Fix bug with default statuses changing of name not affecting on the main orders page. * Fix bug with shipping zones conflict. * Fix bug with email billing settings. * Feature added to turn on or off the trigger on certain days. 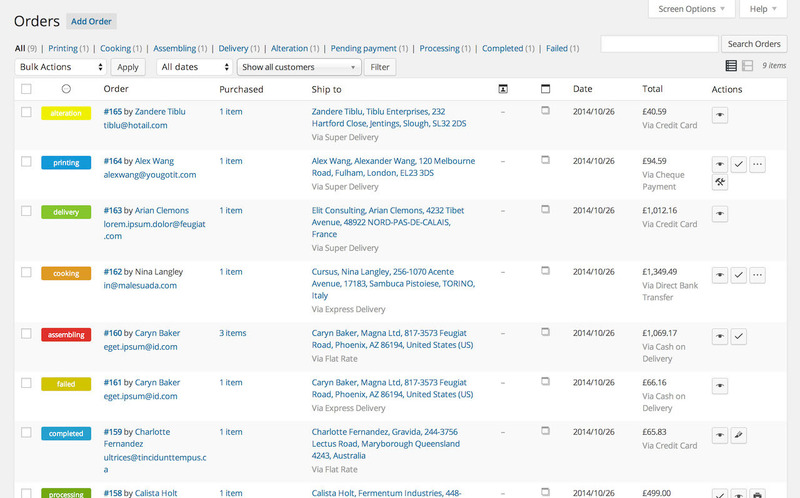 * Feature added to scan orders instantly and bulk action them automatically. * Fix bug with blank fields in emails. * Tweak to validation on creating a new status and editing. * Fix bug of sorting statuses. * Tweak to order layouts. * Fix bug with updater. * Fix bug with order statuses duplicating when existing slug used. * Tweak status style with text filled and lined. * Feature added to enable / disable prompt for button on My Account page. * Fix bug with trigger period not saving. * Tweak to prompt shown when status is cancelled from My Account page. * Fix bug with statuses not changing. * Fix bug with emails not sent when using bulk actions. * Fix bug with custom email addresses not receiving status updates. * Fix bug with emails not sending to customer and administrator at the same time. * Fix bug with blank fields not being ignored in the emails. * Feature added to show the Pay button on the My Account page. 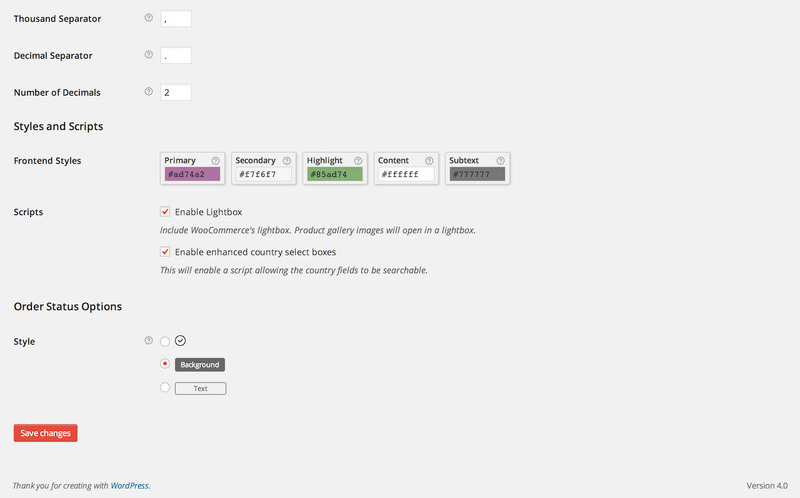 * Change icons on the settings page to match new WooCommerce icons. * Tweak to the font smoothing being applied to fill text statuses. * Tweak to the dashboard icons. * Fix bug with updates causing errors with existing status. * Fix bug with title being replaced. * Fix bug with text fill status types. * Refactor entire plugin to handle high number of orders and reduce loading. * Fix bug with Bank Transfer orders disappearing on Orders page. * Fix bug with Bulk Actions not displaying custom statuses in right order. * Fix bug with case switch error appearing. * Fix bug where featured images could not be set. * Feature to add custom note when triggering action. * Feature to set default status per gateway. * Feature with sorting order statuses. * Fix bug with dashboard icons not appearing correctly. * Fix bug with icon selector not displaying on certain hosts. * Fix bug appearing on the status table page. * Fix bug related to the shipment tracking plugin. * Tweak to the UX when setting status colour, real live change of styles. * Tweak to the UX when setting status icon, real live change of styles. 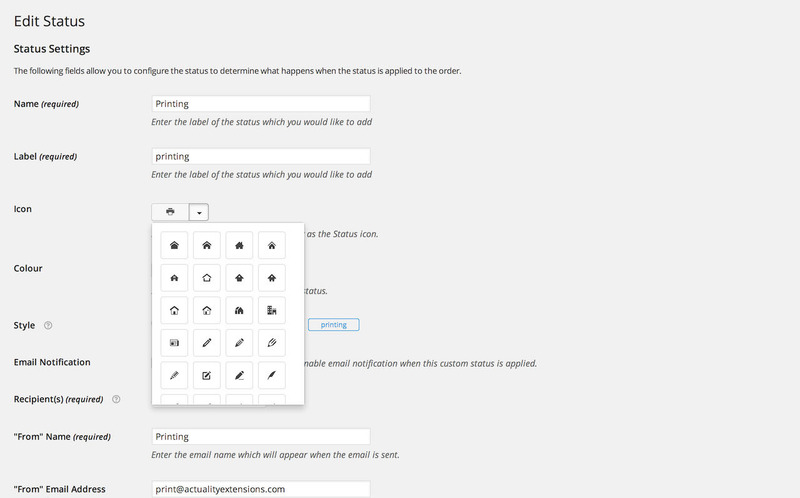 * Tweak to the font icon picker, now includes WooCommerce, Dashboard and Font Awesome icons. * Fix bug with automatic triggers being applied even after the status is changed. * Feature added with payment method short code. * Feature added with shipping method short code. * Tweak to required fields, more defined. * Tweak to settings field that use select2. * Fix bug with order status table showing incorrect item editable. * Feature added where users can now set automatic status trigger after a period of time. * Removal of customer trigger from Order Statuses column. * Rename of customer trigger to My Account. * Tweak to Edit Status page. * Tweak to Order Statuses page. * Tweak to order status page layout by removing icons. * Fix bug on settings page after WooCommerce update. * Fix bug with Avada theme. * Feature added for Advanced Custom Fields short codes. * Fix bug with missing bulk actions. * Fix bug with some orders not coming through due to invalid colour string. * Feature added for Aftership integration thanks to mensmaximus. * Feature added with the message now includes visual editor along with shortcode tool. * Feature added can now disable and enable item editing for default statuses. * Feature added for dashboard WooCommerce Status widget, new widget. * Tweak to action button visibility, can now select none if you do not want button. * Fix bug with missing tab status. * WordPress 4.2 compatibility and fix XSS vulnerability. * Fix bug with stock not being restored. 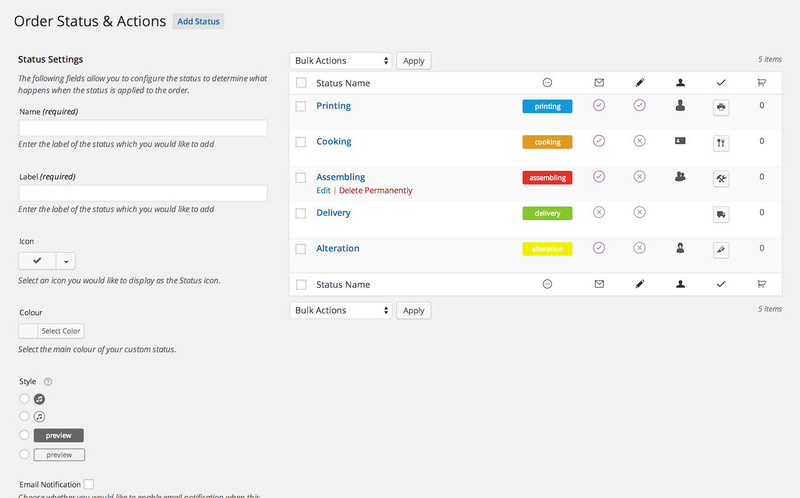 * Feature added to allow users to set which status allows order to be edited. * Fix bug with settings page loaded on some users. * Feature added where you can define whether product reviews can be left or not. * Tweak to localisation strings. * Fix issue when editing old status - migration bug. * Tweak to hooks, new added. * Tweak with status handling. * Feature to allow you to hide or show statuses in the bulk actions menu. * Feature to reset the default statuses (colour and name). * Tweak to the default status table added icon. * Tweak to the action visibility field. * Fix bug with customers not being able to trigger statuses. 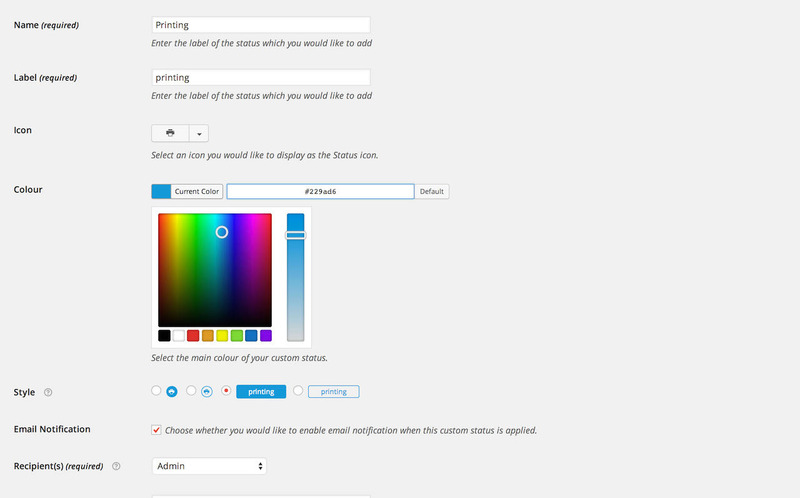 * Feature where you can now choose what colour the icons are for the default WooCommerce order statuses. * Tweak to the edit status page for icons. 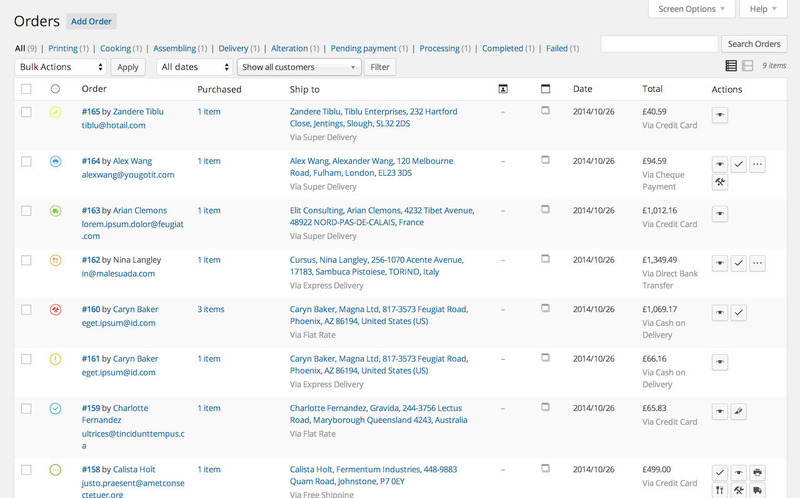 * Feature added where you can decide what happens when new order is placed with completed payment. * Tweak to the settings page. * Fix bug with pagination. * Fix bug with jQuery not being loaded, now included. * Feature added where you can choose what happens to product stock levels when status is applied. * Feature added where you can allow customers to trigger status from My Account page. * Tweak to CSS of the status style. * Fix bug with undefined values. * Fix bug with reports page, refunded orders. * Fix bug with slug database. * Fix bug with reports displaying error. * Fix bug on Orders page with statuses. * Fix bug with Action Visibility. * Fix bug with downloads (Thanks to Rob from Bare Fiction). * Fix bug with missing styles on settings page. * Tweak to status icons on status & actions page. * Tweak to status styles. * Feature added to support permitting downloads on custom status. * Fix bug when setting statuses via the Bulk Actions menu. * Fix bug with Czech and Japanese sites. * Fix bug when deleting statuses. * Fix bug when selecting the "Cancel Orders" option. * Tweak to the Status slug being displayed in status column. * Fix major bug when deleting status, no longer changes all orders status. * Feature compatibility with WooCommerce 2.2. * Feature added when choosing a font icon. * Tweak to the status page. * Fix bug with Cyrillic characters. * Fix bug not support Cyrillic characters. * Fix bug of ghost status appearing after deleting the status in drop down. * Feature included for multisite support. * Fix the 'Customise Email' link page on editing and creating a status. * Feature added where you can now include Checkout Field Editor shortcodes (offical WooThemes extension). 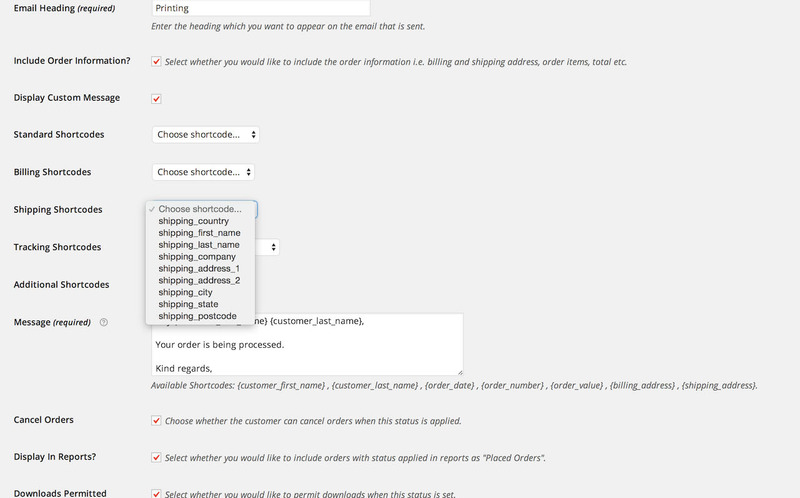 * Feature added where you can now include Shipment Tracking shortcodes (official WooThemes extension). * Fix made on the status page when showing icons. * Fixed a bug regarding the installation. * Feature added where status shows in report. * Feature added where you can set custom email address to send to. * Refined the status icon styles.